Abe Cohen Plumbing and Heating Inc. is who you need to call for residential frozen pipe thawing in Ahuntsic, Baie D'Urfe, Beaconsfield, Bord du Lac, Cote Saint-Luc, Cote St-Luc, Dollard des Ormeaux, Dorval, Downtown, Hampstead, Ile Bizard, Lachine, Lacey Green, Lakeshore, LaSalle, Laval, Mile End, Montreal West, NDG, Nouveaux St. Laurent, Nun's Island, Old Montreal, Outremont, Pierrefonds, Plateau, Pointe Claire, Pointe St. Charles, Roxboro, Ste-Genevieve, St. Henri, Town of Mount Royal, Verdun, Ville St. Laurent, West Island, Westpark, Westmount. If you suspect that a water line or meter is frozen, call us promptly. A frozen pipe should be thawed as soon as possible, and under controlled conditions to prevent leaking and damage to your home. A common misconception is that a water pipe will leak when it freezes and bursts. 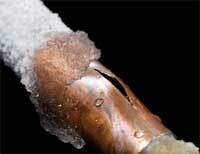 A pipe will often burst when frozen, but the leak generally occurs when the pipe thaws. If a frozen pipe in an inaccessible spot busts, serious property damage can be caused in a very short time. This is why it is safer that the pipe be defrosted under controlled conditions. While waiting for us to arrive, close the water supply to the frozen pipe(s) or to the whole house. If no water runs anywhere in the house, the cause can be a frozen meter or frozen pipe from the city's water main to the house. If water flow is off in only part(s) of the house, then it is most likely that a pipe inside the house is frozen. As cold weather approaches the Montreal area, drain all garden hoses, "summer plumbing", and uninsulated pipes. 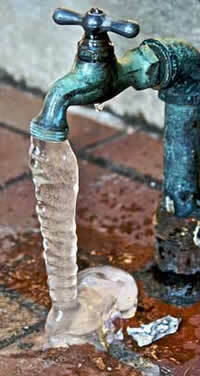 Apply enough heat to prevent freezing in all areas of the house with water pipes.